We provide locks re-keyed service in Bethlehem, Allentown, and Easton PA. Locks rekey is a term of changing the combination of the pins inside a lock cylinder. In this case, when we’ve done re-keying your locks, the old key would not operate your locks, anymore. Furthermore, and in most cases, locks re-key service is cheaper than replacing the entire locks. In addition, when we re-key an existing lock, sometimes, we find that there is a problem with your lock. Don’t be worrying because we’re able to change parts inside the cylinder, in order to repair your lock. Within the last years, we extend our services to broken lock lock repair, re-keying locks, and more. Only LockTech24/7 Locksmith provides the widest range of locksmith services in Bethlehem, PA.
We offer 20 minutes response for emergency locksmith services, whether house lock out or lost car key. With this in mind, you can be positive that your emergency situation is taken off. 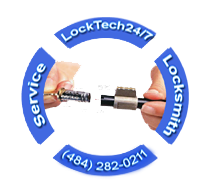 LockTech24/7 is the only locksmith company you need in Bethlehem and the Lehigh Valley. You must remember that our locksmiths arrive with fully equipped mobile workshop, so all work can efficiently be done right at your location. Don’t worry, we’re coming to your rescue! Re-keying locks, in general, is our expertise! You can rely on our residential locksmiths to re-key each and every lock in your home. It doesn’t matter how big your house is, it also no matter what type of lock you would like to re-key. We can re-key all commercial locks in the U.S market! In the process of re-keying locks, we can also match the same key to all your locks. With this in mind, you’ll have one single key that open all the locks in your home. This way is much more comfortable than having many keys on your key-ring. When you concern about your business security, whether you’ve fired one of your staff, or you’re not sure who has the copy of your key, it is better to re-key the locks of your business. Re-keying the locks on the doors of your business, ensure that unauthorized person won’t be able to enter your business. Big corporations has hundreds of employees. It is just a matter of time until your key will get into unauthorized hands. When you renew the key on your business every year, you make sure that only the current and authorized employees have the key to your business. Please don’t take this advise, lightly. We strongly recommend to follow this rule to re-key your locks every years in order to keep your business secured at all time. When you need commercial locksmith service to re-key locks in your office or your business, we can help, too. It’s equally important to remember that we have a full suite of lock and key services. For instance, we also repairing locks or replacing broken locks, upgrading security hardware, and more. We help to secure properties in Bethlehem PA, as well as we help the community of Bethlehem to feel safe. Don’t hesitate to call us when you need to re-key the locks in your home or your business. We stock high quality of security hardware. Your satisfaction is 100% guaranteed as we support all products and labor with a ninety days warranty. We’re only one phone call away. Please call now for emergency service or to schedule appointment.